Do you know how clean your staff’s hands are? One of the services we offer is in house training, running over rules and procedures your company has in place, from personal hygiene through to in putting procedures and allergen control. The idea behind our training sessions is to educate staff so that they don’t just know the rules but understand the reason and importance behind them. Knowledge is key! So back to clean hands…. we have a magical piece of kit that literally highlights dirty hands. On a recent site visit we demonstrated cleaning of hands to a group of staff who after the session will be cleaning their hands thoroughly, not only at work but at home too! Using a substance that shows up under UV light, I asked a volunteer to rub the substance in like they would hand cream. Into every nook and cranny on their hands and nails, then sent them to wash their hands. Now I appreciate that when participating in a hand hygiene session and being watched by a group said volunteer was bound to wash their hands more efficiently then they normally would, but you will still be surprised by the results. With the lights turned off and my UV light switched on any remaining substance on the volunteer’s hands will show up, the picture speaks for itself. 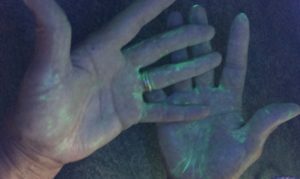 Now on this occasion the glow is just a harmless substance I have asked the volunteer to rub into their hands, but what on other occasions it could be harmful bacteria, meat juices, traces of allergen etc. This could lead to contamination of your food product, ill customers, product recalls and a damaged reputation for the company. Hand cleaning may seem a mundane simple procedure, but still a procedure that needs to be carried out effectively every time. 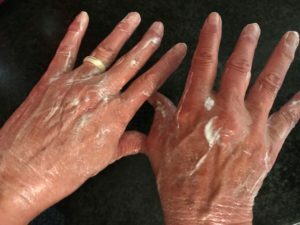 So again, I ask……do you know how clean your staff’s hands are? « Do you provide information about the allergens in food you sell?